You can add your client’s insurance billing information under the Bill To and Insurance Info tab in the client’s details page. Once you're on the Client Details page click the Bill To & Insurance Info tab. 5. Take your Client's Insurance card and fill out as many fields as you can. Not every client will have a plan name, group number, etc. 6. If applicable enter the number of sessions that the client is allowed before reauthorization to the right of Set Reauthorization Reminder. This will count down the number of KEPT appointments. A reminder will be sent when there are only 2 sessions left. 7. If you Accept Assignment for claims click Yes. The accept assignment Yes or No, indicates that you, the provider agrees to accept assignment under the terms of the payer’s program. If set to Yes, the box 13 in CMS1500 will contain "SIGNATURE ON FILE". If set to No, then box 13 will be empty. If set to Yes, the box 12 in CMS1500 will contain "SIGNATURE ON FILE" and Date. If set to Not Required, then box 12 will be empty. 10. Make sure the appropriate relationship of Insured is select under Relationship to Insured. 11. After entering information, click Save Billing Info. 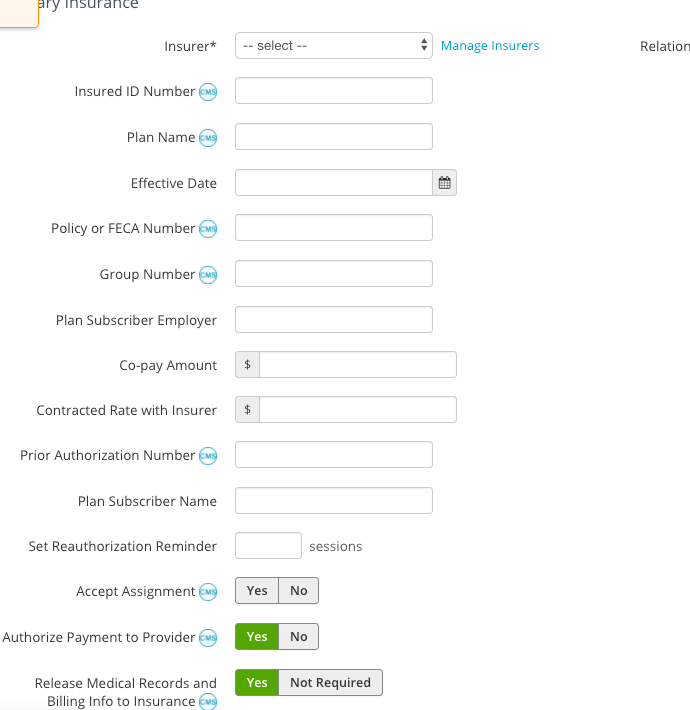 If you need to add multiple Insurers, click the Add Secondary button again and add new Insurer. Repeat steps above.